The kitchen in Unit 5A at 27 Wooster Street in Noho interrupts the sprawling white loft space with warm handcrafted wooden cabinetry by Smallbone of Devizes. Complemented by a marble kitchen island, the brown cabinetry is joined by Wolf appliances like a double oven, a warming drawing for those loaves of fresh bread you’ll be baking, and a Miele dishwasher to clean everything up. The best part? 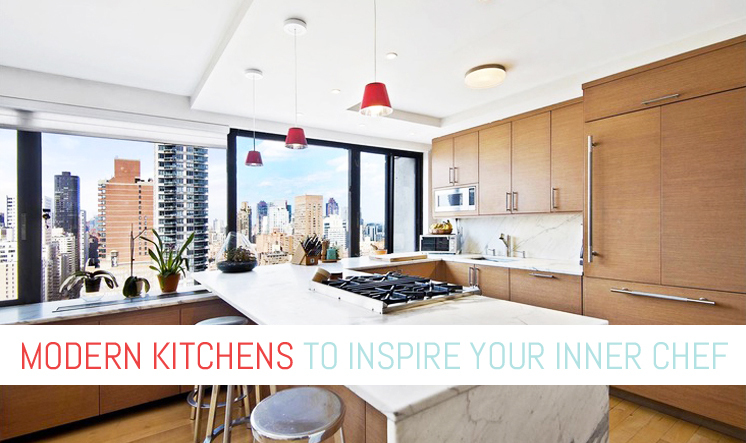 The kitchen faces its own south-facing balcony that over looks gardens — your own private escape in the heart of the city! 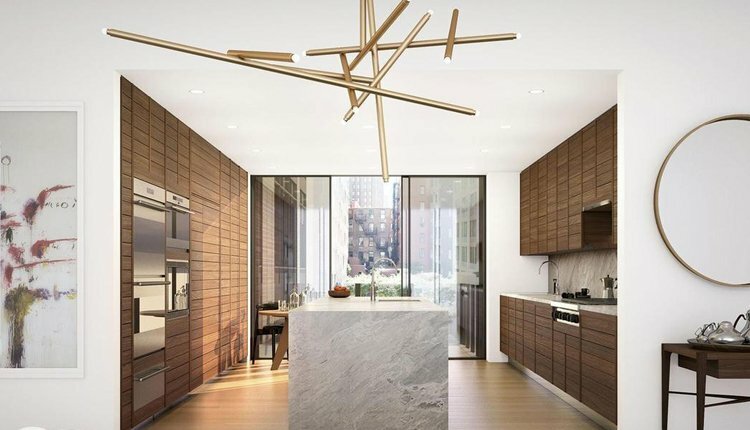 If the Upper East Side is more your thing, this elegant prewar building at 737 Park Avenue and 71st pairs itself with modern design and a state of the art eat-in kitchen, featuring Varenna cabinetry and Miele appliances. The marble-topped kitchen island has dual sinks by Franke, with an extra countertop sink that hovers near the built-in wine refrigerator. The matching marble floor ties the sleek, white kitchen together. 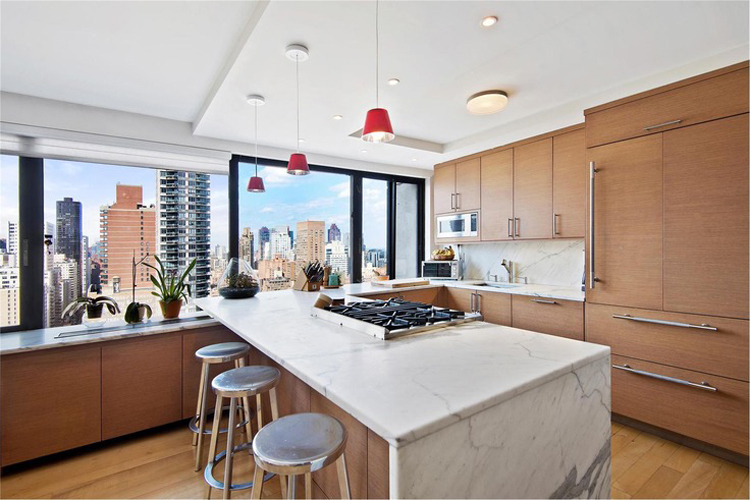 Sunny and bright, the kitchen at The Landmark at 300 East 59th Street makes this apartment feel like a downtown loft. Huge windows with skyline views are met with matching Calcutta slab marble countertops that extend over a giant kitchen island with the gas top range. Pull up some stools and create your own hibachi night, or relax over morning coffee while taking in the views. The Wood Mode kitchen completes the warm feeling of the heart of the home. 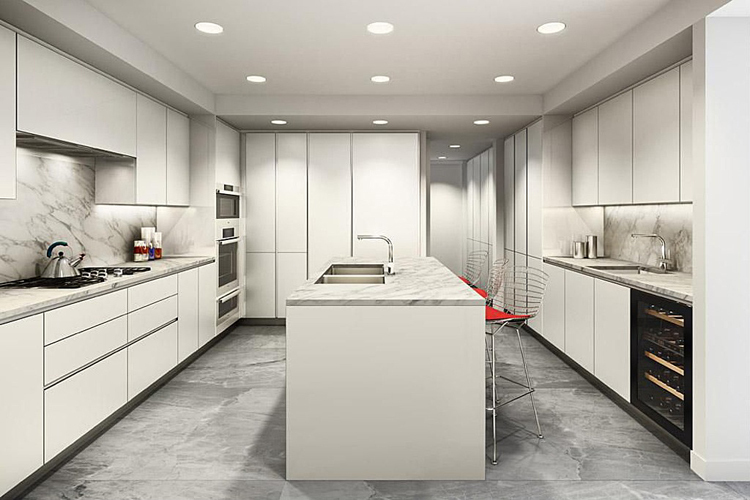 This Greenwich Village kitchen at 147 Waverly Place in Unit 8 features a luxurious chefs kitchen by Valcuccine, complete with not one but two ovens, and a surprising two dishwashers. Whip up something special out of the Subzero refrigerator and serve it up at the walnut breakfast bar! 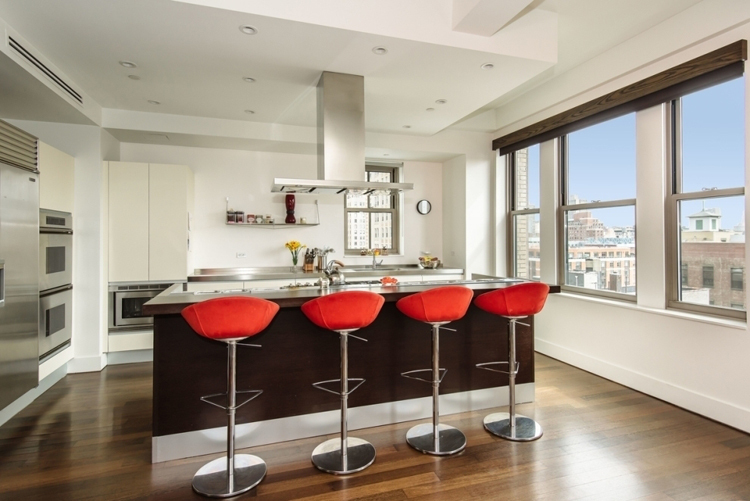 The only corner duplex at Chelsea’s Zeckendorf Towers has a fantastic eat-in kitchen that lets you take your meals with views overlooking Union Square and the Empire State Building. 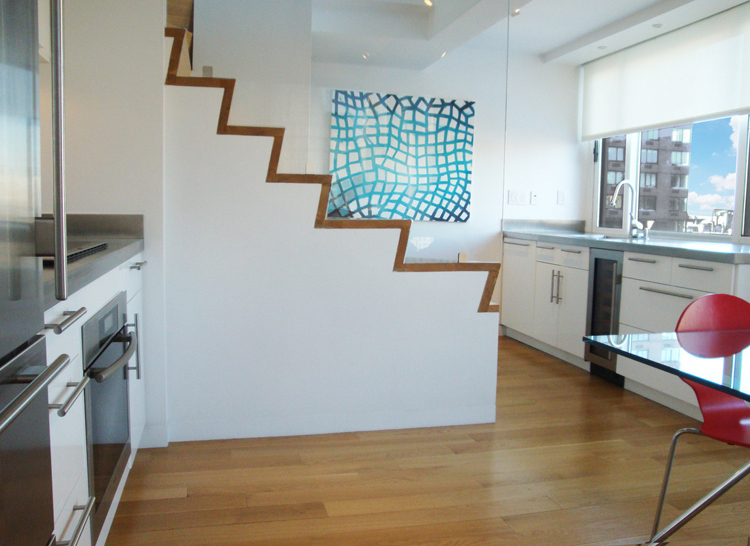 Stairs from the second level meet the kitchen, making a midnight snack easily accessible from any part of the house. Plenty of storage space leaves things feeling uncluttered, and not to mention the incredible city views uninterrupted.